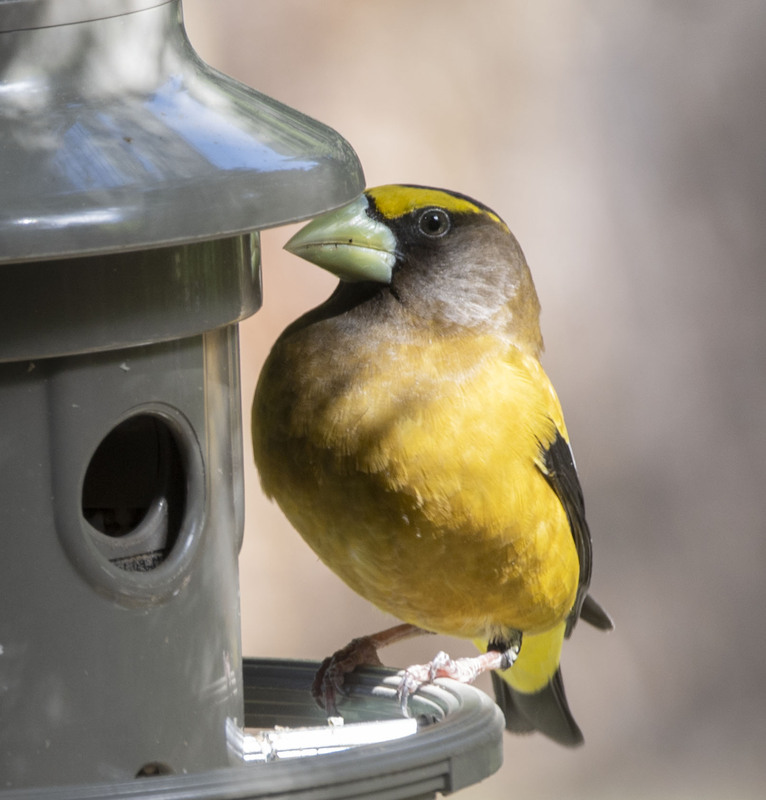 An Evening Grosbeak:Coccothraustes vespertinus or commonly called super finch (only by me of course) looking a bit perplexed as to why the Pine Siskins and Cassins Finches are getting fed from this contraption but not me. Well, perhaps being the heaviest and biggest finch has its disadvantages sometimes as his weight seems to have narrowed the feeder openings enough to make getting that gros-beak into the opening. That bird could crack coconuts with that beak. Unfortunelty that coconut cracker was to big to get into the small seed on offer in our feeder. Yes I would not want to get my finger in the way of those choppers. One of my favorite birds. The males look like spacemen to me! HI Eliza, they are indeed colorful and with teat yellow-green beak I can see the spaceman likeness. One does expect an “S” on his chest. We were glad to have him stop by the years a few times but not often enough. He is a ‘beefy’ finch indeed, but handsome with it. He does wear his muscles well.